← 1979 on stage at Ala Moana Center Friday, 2 p.m.
Today I’ll be volunteering in the Hifi Pop-Up Incubator from 1 to 5 p.m. Come visit and shop! Of course we will ALL be at Andy South’s show tonight at 7 p.m. at CenterStage in Ala Moana Center. It’s the premiere of South by Andy South! Tomorrow I’ll be modeling for MegByDesign, a fabulous new line of easy to wear, perfect for Hawaii clothing by Meg, an Aussie designer who recently moved to Honolulu. The informal show is at 7 p.m. tomorrow (Friday) in the Hifi space, followed by her launch party. Saturday at 3 p.m. please join Allie Lee (the Twitter Queen) and me for a talk on “How to Promote Your Fashion Business.” We’ll offer lots of practical tips and ideas. And of course on Sunday, our big launch of the website for this blog and the art of Jerry Mayfield and Paula Rath. We are both so excited and we would love to have you at the party! 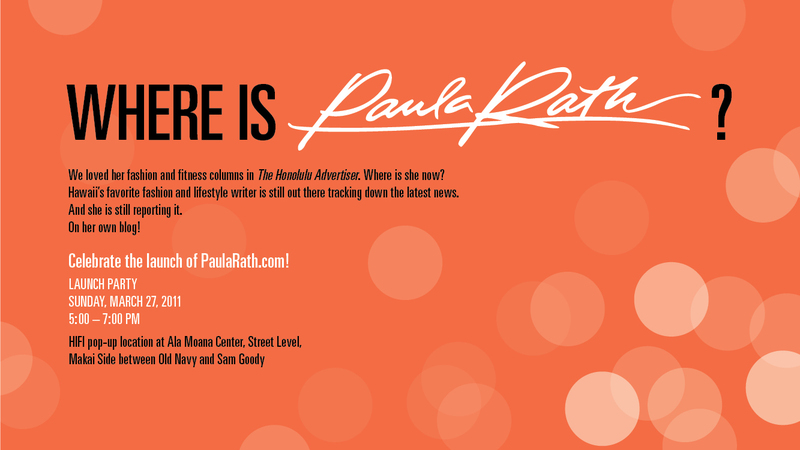 This entry was posted in Hawaii Fashion, Paula Rath's Art and tagged Andy South, Hifi Pop-Up Incubator, MegByDesign. Bookmark the permalink.